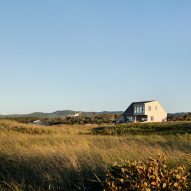 The windswept sand dunes of Quebec's Magdalen Islands informed the outline of this second home for a retired couple, designed by Canadian firm Bourgeois/Lechasseur Architects. 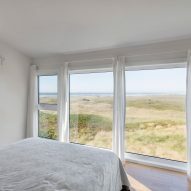 The geometric outline of West Dune House draws inspiration in part from the area's vernacular construction styles, but also responds to the extremely windy conditions typical of the coastal region. "The volume is inspired by local traditional architecture and by the natural shapes of wind-swept dunes," said the architects. "Due to its shape, the house looks as though it was sculpted out of a monolith of sand." Visitors enter the two-storey home through one of its reinforced lateral walls. The door is recessed into this thick partition to protect it from heavy wind gusts. On the ground floor, the architects laid out the main living spaces, as well as an office and guest quarters that enjoy their own bathroom. 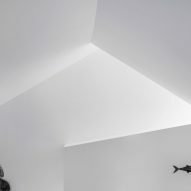 The airy living room is located in a double-height space, beneath the visible outlines of the home's pitched roof. A sheltered terrace extends outside, through floor-to-ceiling sliding doors, protected by the side wall. 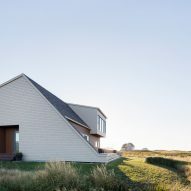 "The side wall follow the roof's slope and extend to the edge of the deck to create an enjoyable space sheltered from the wind," the firm explained. An open-tread staircase leads up to the mezzanine, which contains the master suite. The large bedroom cantilevers above the deck to further protect the it from the harsh weather. From here, the homeowners enjoy unparalleled views of the Gulf of Saint Lawrence and the picturesque surroundings. "Each window looks out onto a different type of landscape," said the architects. "In addition to the dune and the sea, one can see foxes running around nearby." 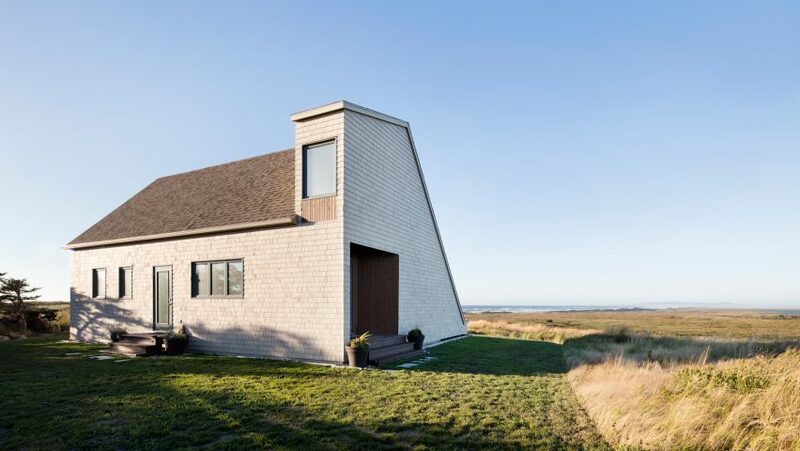 The home is clad in pale cedar shingles, a ubiquitous choice of material in the region for its ability to withstand salty air. Other residential designs completed by Bourgeois/Lechasseur include a home made up of two volumes stacked at perpendicular angles and a simple home designed to "look like a house". Photography is by Adrien Williams unless otherwise indicated.